I recently wrote a post about How to Get Your Act Together in Se7en + 1 Steps… and I intended to write a follow up post straight away: The really practical post of how we get anything done, while homeschooling, where anything is housework. Well the first post was written in the height of summer when school around here chugs at a very low ebb. The place where days are busy and long… if supper is running late a walk on the beach will fix it and amongst the piles of books being read and the mountains of impressive projects you kind of wonder how on earth you will ever find time for actual school. I tell you the truth – I just don’t know. When we have a couple of days off school between the laundry and the dishes and just life, I have no idea where we find the time to school. Running a ten-people home, and any number of visitors in and out, housework can quickly add up to a full-time job. It’s Not Them and Me, It is Us: The attitude around here is very much we homeschool together, we keep house together, we play together and we work together… maybe not at the same things as each other, but I am learning just as much as our kids as we homeschool together and they are doing a good portion of the cooking and cleaning alongside me. I am not up before dawn doing all the housework so that our day runs smoothly and my children are not up long after midnight doing the dishes either. The point is whatever your work is, whatever you do the house has to run smoothly so that you can live. Forget about chore charts, stickers, rewards, incentives… jobs have to be done, so we do them. Cleaning and Tidying: There is a vast difference between cleaning and tidying and you cannot clean an untidy house… it is very much a case of two steps forward and ten steps back. We keep our house pretty tidy, not perfectly tidy mind you… people are living here, but visitor ready. Tidying up does take a lot of discipline and really we pick up as we go. We always tidy up everything before meals. That alone gives us an opportunity to start fresh at breakfast time, after lunch. We never clean much if we are getting visitors… we do tidy. We often clean after visitors though. Some afternoons a week when we routinely have fifteen extra kids over for a play, we will clean our home afterwards but definitely not before that. Decluttering and Organising: There is a huge difference between decluttering and organising… We declutter all the time, sort through our clothes daily… straighten as I go. I literally step of bed into the shower, walk past my younger kids’ closet and straighten – every day. While it is there job to put their laundry away, I cannot expect them to try and control vast amounts of clothes. So we declutter constantly. We have a strict one on and one in the wash policy, and no space for anything else. We have a donate zone at the front door – it isn’t that pretty. As soon as the bag full we pop the bag into the garage. Then I wait for a good time to donate or I call a local shelter and they collect it. Seriously donate, donate, donate, the less you have to tidy up the better. A slight confession, if folk leave things lying around and I ask them to put them away a couple of times… then those items move along to the depths of the donate pile. If they were treasured items they would have a place and be put away… the items that are not treasured are not taken care off and can move along, someone else most likely needs them. Organising is about having a place to put the things after decluttering. If you don’t have a place for stuff then you really can’t expect folk to put it away. I don’t organise as I go. I do have organising ideas that spring to mind, I pop them on the noticeboard and let a list grow. From time to time we have a Sort-It-Out-Day and that’s when I implement new organising ideas. 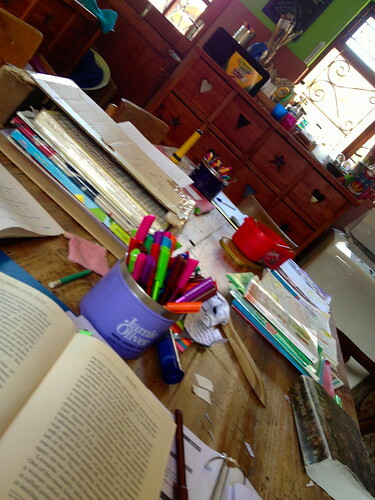 I cannot do school and organise, I have to be organised for school… and if something isn’t organised then it has to wait for a “Sort-It-Out Day” – because otherwise it becomes a niggling distraction and the reason we don’t do school for a week or two could well be an organising project I dive into without thinking. Cleaning a shelf in five minutes as I walk past, is one thing… but organising all the kitchen cupboards is quite another. Most things are workable as they are. It is lovely to have organised art supplies, but you can actually do art if it isn’t organised – declutter your art materials and wait for a working day to organise things. Loads of Laundry: We have a system for doing laundry, and you probably have one too. We do not have laundry hampers… we have a washer. When one of us has dirty laundry we put it into the washer. I put the washer on before I go to bed. If someone doesn’t get their laundry to the washer, that’s not the end of the world – the washer will go again in a day or two. If an item is urgent, then folks would be sure to get it into the washer. When I wake up in the morning the washing is done and the clean laundry is spread on the table and sorted. It is much quicker to shake out and straighten the laundry and then hang it out to dry. A child sorts our wet laundry into piles of tops, bottoms and undies, all ready to hang. And then the laundry is placed on the side… after breakfast when there are a couple of minutes of “transitional chaos” when the table is cleared and the books are brought out… I dash out and hang the laundry… did I mention watch the ocean and hang the laundry. I will take a moment of peace when I can get it. Actually, our kids all know that that is a good time to catch me alone and they will seek me out for a moment. At the end of the day the washing is brought in and plonked on the table and has to be folded and put away before we can have dinner. Table for Ten and their Guests: We have blogged about our Table for Ten before… We eat all our meals together around the table… preparation, and clean-up are all in one place at the same time. We clean up as we go, so by the time we sit down to dinner we really only have to wash ten plates, ten glasses and the cutlery. Also, I firmly believe that if you are old enough to learn how to read then you are definitely old enough to make a sandwich and a cup of tea… and if you can make one sandwich then you can make ten. My kids love and adore any sort of food preparation… so whoever gets to finish school first often gets to be the one to get lunch moving along. Different children help with dinner on different days… it is absolutely vital to me that all our kids grow up able and eager to make and serve meals on a regular basis. Floors, Floors and More Floors: Honestly our floors get swept and mopped once a week and if everything is tidy it takes about twenty minutes to sweep and mop the entire house… two bedrooms, a kitchen and a lounge just don’t take that long. And no, I never ever want a bigger house to clean. I just give everyone a warning that there will be sweeping so that everyone picks up there stuff off the floor and then the sweeping begins and before everything settles we mop it at the same time. The kitchen floor however is another story and absolutely has to be swept after every single meal. And the bathroom, this is a perpetual project, we have five boys over here… the mop is always at the ready… and we mop after breakfast, before lunch, before dinner and after bedtime… and any other time it might need a mopping!!! Don’t be Afraid to Outsource: I never do ironing. We have a laundry 2 blocks down from us… and I can not want to iron ever. I also have a lady, who comes one morning a week, from 10:30 till lunchtime. She puts fresh sheets on the beds and mops all the floors. That’s the household help I need, and I am realising my kids are all old enough to grab their sheets off the line and put them back on their beds and honestly mopping the floor isn’t that big a deal… but it is a gift I give myself and makes me feel on top of the world to have a clean house, even momentarily, once a week. Often she can’t make it… and then we just do the job without her help and school takes a little longer and we so appreciate it the next week when she can come. 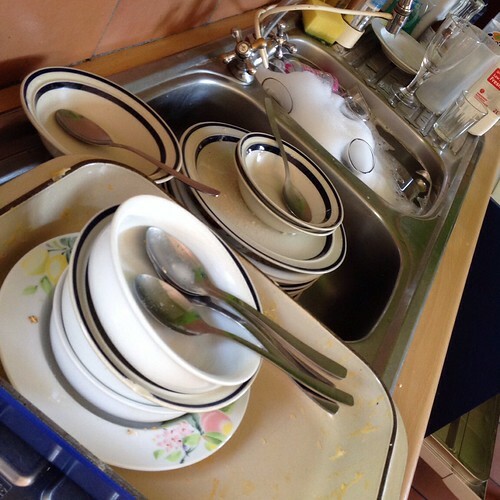 My huge delegation fail has to be dishes… I actually give lessons in dishwashing: stack them, scrape them, glasses first, then plates, then silverware… lessons I tell you. But my kids do not (or will not get it!!!). And the clattering breakages… sigh!!! One takes hours and cleans every last speck, since the beginning of time… and pushes bedtime till three in the morning… another creates bubbles to the ceiling but the dishes are filthy afterwards… out of eight, I have one good but very reluctant dishwasher so far. I believe in working to their strengths, he does the lunch dishes and the rest of the time I catch up on my favourite podcasts… to say I feel like I know these podcasters personally is an understatement… they have spent hours and hours chatting with me, while I wash the dishes!!! A Housekeeping Day in the Life. First one up packs away the dishes from the previous night. Second one up sorts the laundry, and the third one up packs away the silverware and the fourth one sweeps the whole kitchen floor… and so on. By then everyone is up and dressed and beds are made while I take a shower… breakfast magically lands on the table. We have breakfast and do a bit of family reading and school… and then everyone is off to clean teeth and get their school books… and I quickly hang the laundry. Then absolutely no more jobs until about half an hour before lunch. Lunch prep begins and a round the house quick tidy-up. 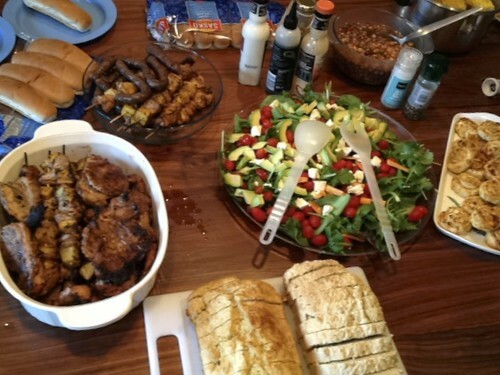 Immediately after lunch we clear the table, wash the dishes and sweep under the table. Then everyone reads and rests for a while, and folks drift into their own thing. Later in the afternoon, about four, the laundry is brought in and folded and dinner prep begins. And the house is tidied up… we usually have at least one guest join us for dinner, it is a good incentive to tidy the most drastic messes. Finally the dinner is done the tables cleared and the dishes stacked… kids head for the shower and laundry goes into the washer and towels are hung up. As soon as most kids are in bed, it is my time to blog. I do the dinner dishes and put the washer on and head for bed. 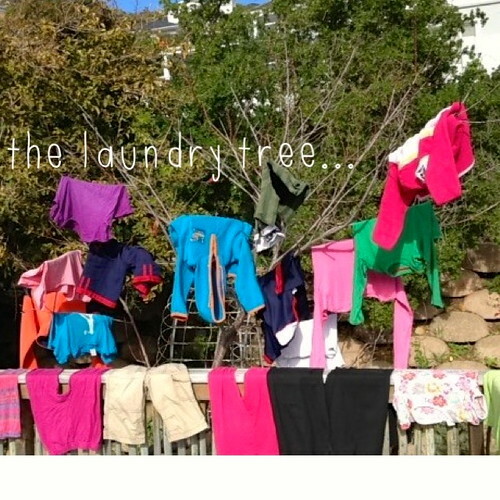 That’s it, the post in which I literally air our dirty laundry. 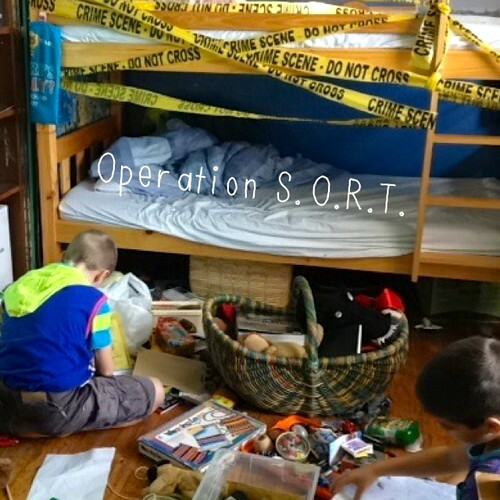 Just remember that I no longer have se7en kids under ten, so the work load can be shared a bit better… in theory!!! And to be quite honest, I have a mental image of what our house should look like…that the dream and we get by a little closer to reality. Often housework has to take precedence over school and often school has to be done rather than housework. There are days when I know friends are coming over and I just let the dishes wait until they get there… I can wash dishes and chat with a friend, it makes it go a lot faster. And many a dinner guest has sat at our table and watch the end of the day “laundry fold” before we have dinner. Our house isn’t spotless, it’s lived in… our schooling isn’t perfect, we make progress. And as a team we seem to be able to get by. Now don’t ask about blogging, that is a whole ‘nother full-time job!!! And the when and the how of that, really requires it’s very own post. Hay Tami, I so hear you!!! We have tamed our paper monster by being totally and utterly ruthless. And I so feared being the family nag that I really do limit our “tidying hours” and the rest of the time I leave it as a free for all. Some how everyone else’s mess always looks so much worse than my own and many of them are!!! When we tidy, we all tidy, including myself and I try to focus on getting the job done rather than who was responsible!!! There has to be a lot of grace and forgiveness in the business of housework!!! Hope you all have a fabulous weekend, thanks for stopping by!!! Oh Christi, I love your comment… I do BELIEVE IT too… always stretching to achieve that goal!!! Have a fabulous weekend!!! Just loved it! I have ten children. The part that I love the MOST (although I loved all of it!) is your attitude. You thoroughly embrace the work. Hey, guys, we’re all here and there’s work to be done so let’s just do it and move on! I so agree about the TOGETHERNESS of all of it. It makes a huge difference when we’re working as a team. When you get a free moment (har-dee-har-har), could you send some podcast recommendations? Thank you for making the time to write this. LOVE this post!! We do together for chores (and just about everything) and it makes all the difference. I agree so much with if you’re old enough to…fill in the blank…than you’re old enough to dust, clean, vacuum, fold, make dinner, etc. I also want to know what you’re listening to…. and do you listen to Michael Hyatt? I think you’d like him. Well, friend, I’ve seen it all in action and i’m STILL blown away by all those kids who LISTEN the first time. Bottle it up and sell it to us, will you? I know what you mean about filling up the day in the summer. I always wonder how we ever have time to squeeze in school! Thanks for the post. Hay Rachel… Glad you enjoyed the post… I so found that if I say t my kids: “go and do anything,” that it never gets done or it takes all day… But if I say let’s tackle this mess quickly, then they enjoy getting on with it and it passes really quickly. I am trying to teach them that is a job is worth doing then lets get stuck in… let’s hope it’s a life long lesson. And I promise a podcast post really soon, I have had one in my drafts about forever!!! Hope you all have a great weekend!!! Hay Emm, So happy to have you along as a fly on the wall, so glad that you enjoyed the post!!! Have a fabulous weekend!!! Oh Marcia… you do make me smile… I do have a podcast post coming and I do listen to Michael Hyatt!!! And as for listening kids… I have a very simple trick – so simple that it is almost embarrassing to write it down and so short that it doesn’t warrant a blog post. Maybe I’ll email it to you!!! Meanwhile have a fabulous weekend!!! Nita, that’s a very good question… I believe in working with their strengths. And I don’t expect everyone to master every chore, most chores yes… and dish-washing before they leave home – you bet!!! Because I work with their strengths they tend to do the things I ask them to do and if they don’t it is because of “the galactic built in forgettery” that we all have, rather than willful neglect!!! So I am patient and let it lie. If they don’t sweep the floor when I ask, then a number of siblings will notice that the floor isn’t swept and I don’t have to say anything… If a fresh bin bag isn’t put in place then the person who puts out the garbage cant do their job… and so it goes. Their jobs are all important keys in the chain of jobs… if they “forget to do” a job, to be sure their will be a little blip in the system and they will be reminded!!! Hope that helps, remember many hands make light work!!! Hope you have a great weekend!!! Hay Lillian, Good to hear from you… My children are so enjoying their letters from you all, you would not believe!!! Hope you have a fabulous weekend!!! 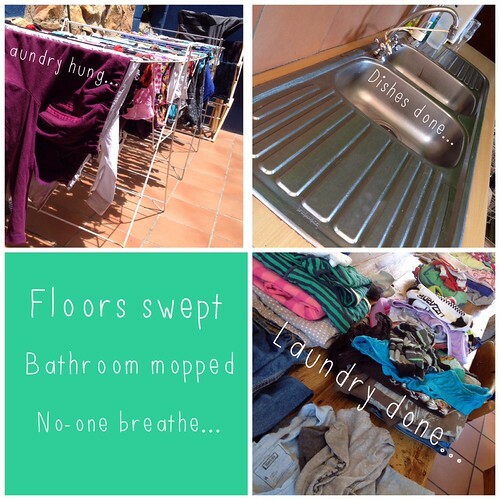 I used to obsess about the cleaning – drove me (and my family) mad! But now with the new baby – I just do not have time. So I make a point of tidying up before I go to bed and again before the kids get home from school. I have a lady once a week who cleans for me. Yay, thank you..loved this …so I am with Rachel….PODCASTS…PODCASTS….can you hear my chant in the valley? Thank you Tammy, Sorry it took so long to post this!!! And yes a podcast post is in the pipeline!!! Hope you have a great week!!! 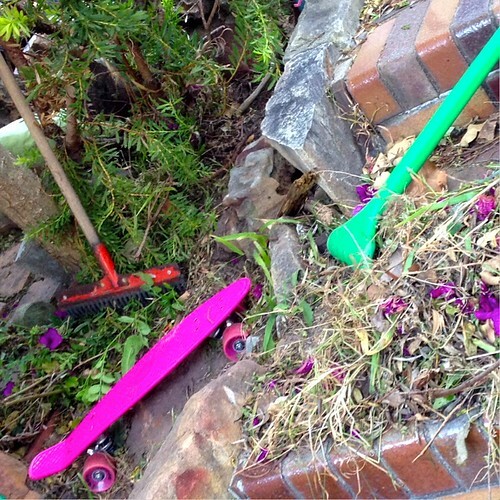 Hi Laura… I cannot believe how before kids I would think our house was a mess, but no it clearly wasn’t!!! I very much limit my tidying up time to twice a day and the rest of the time I turn a blind eye. I have to say with a new baby, I never did anything for weeks, I firmly believe that households with new babies are exempt from any but the most essential work. Eventually I would wake up from the fugg and be unable to stand it anymore and then I knew it was time to clean up!!! Hope you have a great week!!! Send me an email about how you get your children to listen too!! Loved this post! Thank you so much! Oh Lecia, you are so not alone in that request… I should perhaps blog the answer to your question. Unfortunately I don’t have the complete answer… and I know one or two people that would about roll on the floor laughing at the thought that I claimed that I did know!!! But we all have our moments and my kids tend to listen during theirs… I will try and think up a post with tips in it for you and a couple of other moms, who asked as well. Meantime, hope you have a great weekend!! !